Holding the camera as steadily as I could, I hit the zoom lever. Not knowing in which direction to turn, I simply pressed the shutter button repeatedly. .
Coming from all directions, they were everywhere. From the top of the rock formation, from in between the rocks, from the grass, they wanted a handout. The next thing I knew there was one on my leg, scaling it like a tree trunk. Then one climbed up the leg of the blue chaise lounge, strategically placing himself right at the edge of my plate, which was nestled securely in my lap. Their claws, spread open revealing their toes, tickled as they crossed my skin. While one kept licking my nail polish on one foot, the one in my lap took the direct approach, diving into my salad! Lifting the plate in high in the air with one hand, I grabbed pieces of lettuce and sucked off the dressing before handing it off. They patiently waited for more, tilting their heads in all directions as they watched and waited. Lettuce, tomatoes, cucumbers, celery leaves…they devoured it all with ease. It was quite apparent that they loved vegetables, although the bread and chicken seemed to go down easily too. Some larger ones chased the smaller ones away even before they had a chance to get near my chair. Oh well, I guess there are gluttons in every species. However, was it coincidence that when I returned from the beach and approached my chair , I noticed something extra right on top of my beach bag. Iguana poop! Yes, dried, hard, iguana poop lying right on top of the bag! LOL!!!! Nothing but the best when you’re on vacation! 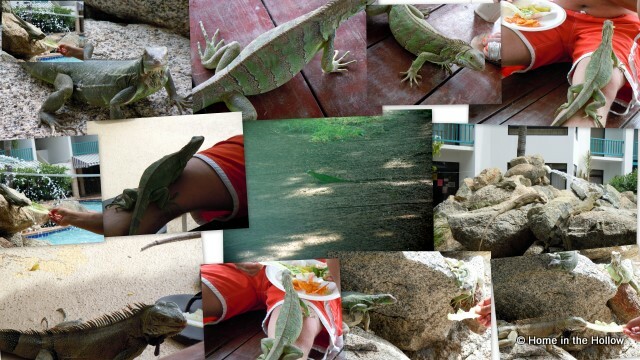 When we were on St. John our Villa was home to a family of Iguanas. The guide who brought us to the Villa said "Be careful when you walk hrough the trees to the beach.. sometimes the Iquanas fall from their perch.. on to you. not sure i'd have appreciated them in my lap stealing food off my plate, but they sure are entertaining! Great pictures and what else could H be for but Home In the Hallow? Tomorrow - I for iguanas! That would be too much for me...lol. Great pics! I guess in a way they are the 'squirrels' of the hot country. I expect they also take care of some of the least nice insects too. Good to have around. ATB! I have to say, I have a lot of respect for someone who could let one of those little critters run up her leg and be okay with it--That would have been 'my poo' on the bag!!! Let me guess. I is for Iguanas Attack, and W is for What They Left Behind? Wow. I don't think I've ever had an iguana encounter before. I'd like for that trend to continue. Pleasure to meet you from the A-Z Challenge! You are sooo brave! And I sooo enjoy reading all these post abut a fabulous vacation that we had there as well. This is almost as good as going back again. Well almost. We watched Iguanas swim in the pools and crawl from one end to the other. amazing little creatures! should be P is for PooP. i can relate to that! ha! Gosh, what an interesting experience. Great pictures.